SINGAPORE (Feb 16): Oil held steady on Thursday, supported by ongoing supply cuts led by producer group OPEC, while rising fuel inventories and crude production in the United States dragged on prices. Brent crude futures were trading at US$55.74 per barrel at 0550 GMT, down just 1 US cent from their last close. US West Texas Intermediate (WTI) crude futures dropped 6 US cents to US$53.05 per barrel. The Organization of the Petroleum Exporting Countries (OPEC) and other producers including Russia have agreed to cut output by almost 1.8 million barrels per day (bpd) during the first half of 2017, and estimates suggest compliance by OPEC is around 90%. The production cuts are aimed at reining in a global fuel supply overhang that has dogged markets for over two years. Yet despite action so far, inventories remain bloated and supplies high, especially in the United States. US crude oil and gasoline inventories soared to record highs last week as refineries cut output and gasoline demand softened, the Energy Information Administration said on Wednesday. Crude inventories rose 9.5 million barrels in the week ended Feb 10, nearly three times more than analyst expectations, boosting commercial stocks to an all-time record at 518 million barrels. Gasoline stocks rose 2.8 million barrels, compared with analyst expectations in a Reuters poll for a 752,000-barrel drop. That pushed inventories of the fuel to a record at 259 million barrels. The bloated stocks come as US crude oil production has risen 6.5% since mid-2016 to 8.98 million bpd. Because of the conflicting price drivers of OPEC's cuts and rising US inventories and production, analysts said that prices were largely moving sideways. Both Brent and WTI crude futures have traded within a US$5 per barrel price range since the start of the year. 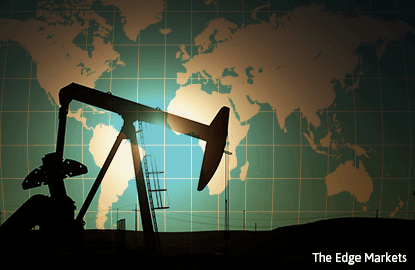 "There's no doubt that the world oil market is very much in wait-and-see mode, which is why the price has remained in the mid-US$50s per barrel range since mid-December," said Gavin Wendt, founding director and senior resource analyst at commodity research firm MineLife. "The biggest factor is what might happen with US shale production," he said, adding that rising shale output had the potential to damage oil price stability. Wendt said oil would likely trade between US$45 and US$55 per barrel in 2017.